Coat by SAGA. 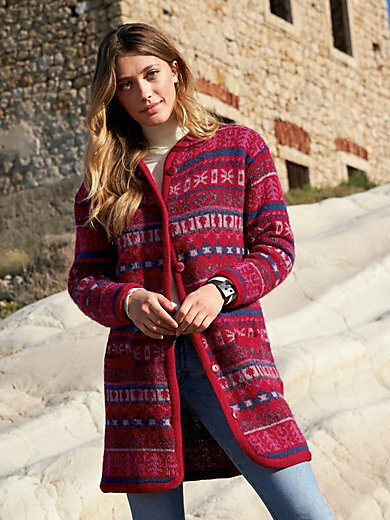 In a casual fit with fine, knitted multi-coloured jacquard. With 2 welt pockets and pretty corozo buttons. Windproof and water repellent. Long, warm knitwear with a round neckline, genuine corozo buttons, 2 practical pockets and plain trim along the edges and pocket openings. The ingeniously knitted-in jacquard pattern in wonderful colour combinations requires specialist knowledge to produce and gives the styles their unique charm. 100% new milled wool. Length approx. 33ins. The coat should be washed by hand.